Sterilizing equipment, a critical aspect of modern medical care, can be accomplished by bombarding the equipment and its packaging with a beam of electrons or X-rays derived from a particle accelerator. Sterilizing equipment is a critical aspect of modern medical care: think of all the contact patients have with syringes, surgical tools, and bandages. The first breakthrough in sterilization technology was the autoclave, which kills microbes with high-pressure steam; its been used in hospitals for more than a century. Todays medical equipment may be bombarded with gamma rays or treated with a chemical such as ethylene oxide gas. But there is another method with unique advantages: bombarding the equipment and its packaging with a beam of electrons or X-rays derived from a particle accelerator. 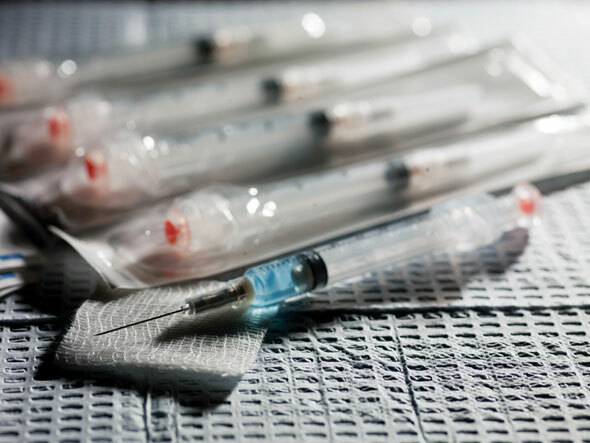 For convenience and safety, manufacturers often sterilize syringes, bandages, surgical tools, and other medical gear in their final packaging. They need to kill every single germ on both the product and packaging, which are very different materials, without damaging or altering either. Heat sterilization is out of the question, because it could warp the plastic. And techniques involving gamma radiation or harsh chemicals raise concerns about worker safety and proper waste disposal. Particle accelerators sidestep those problems. E-beam sterilization dates back to 1956, when Johnson & Johnson developed the first commercial system. As accelerator technology advanced, pushed along by the demands of high-energy physics research at US national laboratories, industry continued to refine accelerators for its own needs. Today e-beam represents a small but promising segment of the medical equipment sterilization market. In an e-beam facility, packaged syringes, surgical sutures, gauze, and so on ride a conveyor belt through a tunnel while one or more small accelerators hit them with electron beams. Electrons pass through the packaging materials and eradicate any microbes on the surface of the product. Like any method, this one has its pros and cons. E-beams have limited penetration and work best on simple, low-density, high-volume products, such as syringes and bandages. One big advantage of the method is that it takes a matter of seconds, compared to hours for gamma-ray sterilization, says Wayne Rogers, a consultant with years of experience in the field. E-beams are less damaging to some materials and devices than other techniques, and leave no chemical residue. E-beams shift from the higher to lower doses that are required for different products much faster than other technologies allow. High-powered electron accelerators are also being used to generate X-rays, which are as effective as gamma rays for sterilization.